It looked simple enough…when the Accidental Locavore was in Nice last spring, we noticed small groups of electric cars near tourist areas, ready to be rented. After spending a ton of money on the standard rental car and parking (not to mention gas! ), this looked like a great alternative. We loved the idea of being able to swipe a card, unplug a car, drive and plug it back in when you return and the Auto Bleue literature promised that it would be “toute simplicite” (made easy). No hassles and no searching for gas stations open past 9:00. Boy, were we wrong! First clue that it wasn’t going to be that easy came when my husband tried to do the online application. 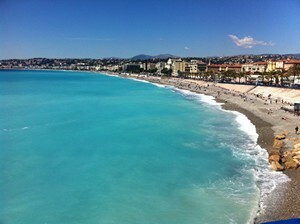 He was told that the easiest thing to do was to go to the office in Nice, near the train station. Which might have been the case, had it not been the 3rd of April, an innocent looking date, but early enough in the month to bring everyone in to renew their monthly transportation passes. After about a 45 minute wait, he came face-to-face with French bureaucracy at its best. We finally navigated (pun intended) a pass for the cars, along with a folder with instructions in French (11 pages) and English (3 pages). Second clue: trying to reserve a car. Our idea was to grab a car, have lunch in Antibes, stop in Vence say hi to our friend who works in the tourist office, have dinner and come back to Nice. Toute simplicite, n’est pas? On the site, you have the option of reserving by the hour, for the morning, afternoon or the day. The problem is that for the morning you have to pick the car up between 7-9 AM and you only have it for four hours, so you have to come back before lunch. The afternoon block was also too late to have lunch, so we booked the car for the day, picking it up at 1:00 and bringing it back at 11 (for what we thought would be 50 euros). On the appointed day we went off to find our car, swiped the card and headed off toward Antibes. Immediately, the GPS got jammed, which didn’t seem to be an issue, since we knew the way. 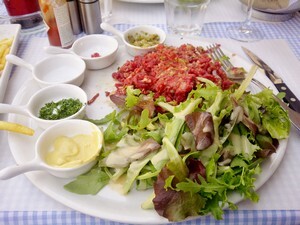 Had a lovely time in Antibes and a great lunch of the thinnest crust pizza and a do-it-yourself steak tartare. Headed off towards Vence, where it was raining. The Auto Bleue website says that if you plug in the car when you park it, you get a 25% discount, so we plugged in the car, hoping it would recharge at least a little. We saw our friend and then since it was raining harder, decided not to stick around for dinner, but to head back early. You know that they WILL get it all worked out. I love stories like this about France…. Next post: Does Grass-Fed Beef Make Great Pastrami?